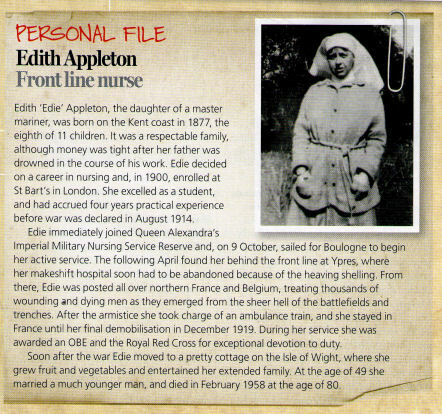 Great article - Nurses of the First World War - in the June 2012 edition of WDYTYA magazine. It's by our very own Ruth Cowen who did such a wonderful job of editing the book of Edie's diaries (click here for info about the book). The magazine is available in all good bookstores although it took me several forays to track down a copy: finally found one in the bookstore on Paddington Station. But I'm sure it's available in lots of other places too. Very well worth a read. 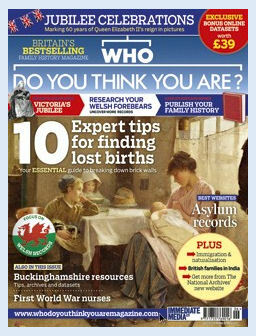 The WDYTYA website is at http://www.whodoyouthinkyouaremagazine.com/. Here are a couple of extracts from the article. Good to see that Sue Light's Scarletfinders website also gets a mention. There's more about Edie in the main article.